The BC8500XLT looks a lot like the BC9000XLT. From the inside, things are different. The discriminator output modification for this scanner is rather straightforward. 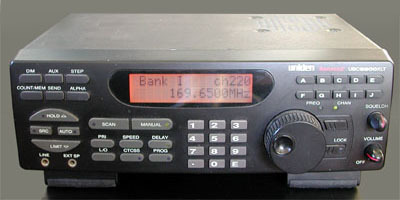 When you remove the top lid of the scanner and disconnect the loudspeaker connector, the unfiltered audio is available from pin 9 of the receiver IC, a DIL MC3361. A 10 k resistor is soldered to pin 9 of the MC3361. A 3.5 mm chassis terminal is mounted in the back of the scanner. 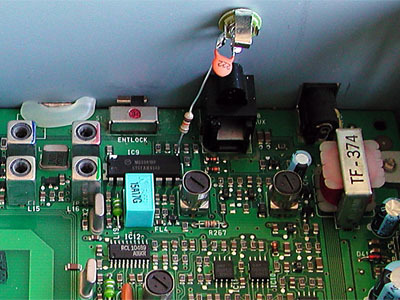 The other lead of the resistor can be connected directly with the chassis terminal. There is no need for a separate ground connection, as the scanner's housing is grounded. 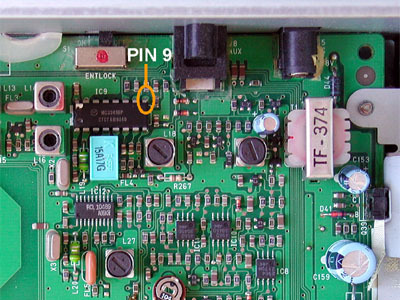 Because the baseband signal contains a 455 kHz IF component, as usual with the MC3361, a 2.2 n capacitor is soldered across the lugs of the chassis plug. Together with the 10 k resistor, a lowpass filter is created that effectively suppresses the IF component, while leaving the data signal intact.